The International power of Rotary can be seen from the banner written in a different language to that spoken in Lincoln but with a perfectly understandable message to Rotarians worldwide. 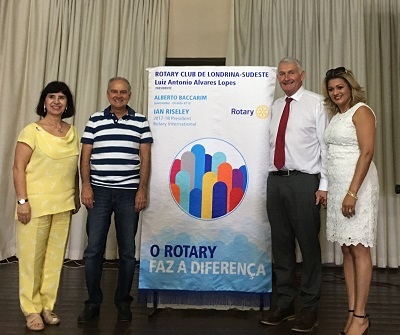 President Elect John and Rotarian Marcia recently visited the Rotary Club of Londrina Sudeste in southern Brazil. They presented a club banner and John gave a talk which was ably translated by Marcia. Pictured are President Luiz (Londrina Sudeste), and Assistant District Governor Teresa with John and Marcia.